Partial shutdown of the federal government enters 34th day. The ongoing partial-shutdown of the federal government began on Dec. 22, now entering its 34th day–the longest in U.S. history. Over 800,000 federal employees are working without pay, having not received a paycheck in over a month, according to sources cited by the New York Times. This eclipses the $4,830 median for household savings in America. 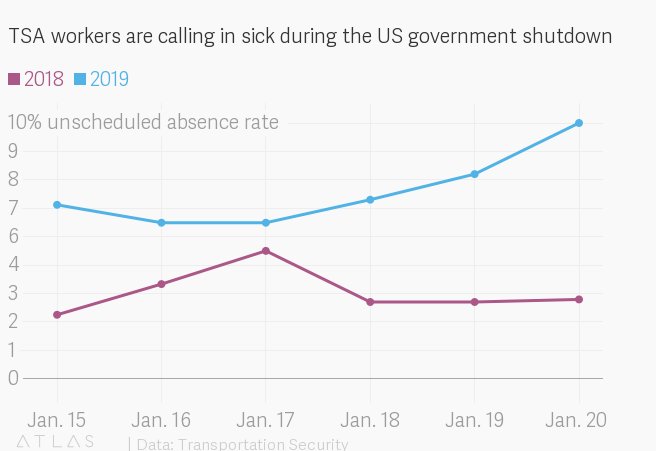 One agency showing particular strain is the TSA, with 10% of their workforce calling out sick last weekend. The impact on Americans outside of federal employment is only set to grow, with federal courts, food assistance, and law enforcement running out of funds. With Democratic Speaker of the House Nancy Pelosi (D-CA) and President Donald Trump holding firm in their opposition, the government shutdown is poised to enter uncharted territory. As more government services shutdown, observers fear unknown consequences. Earlier this week, FBI agents warned that the ongoing shutdown is impacting ongoing investigations and is a serious national security risk, according to reporting in the Washington Times. Thousands of Americans have reached out to their representatives in Congress through Action Button. As the funding crisis occupies headlines, Congress is continuing to work on other, long term issues such as climate change, defense policy, and economic policy. Congress is considering various pieces of legislation, including the “Strengthening America’s Security in the Middle East Act of 2019” and “Assault Weapons Ban of 2019” in the Senate, and “Homeland Threat Assessment Act” and “FIND Trafficking Act” in the House. With a new Congress beginning their second month in office, it is vital that constituent voices are heard.